Nestled in the hills above Los Gatos is a magnificent estate known as the Byington Winery. But we only traveled one mile from our Los Altos home to sample the fruits of their labor. That’s because a few short weeks ago, Byington opened the first tasting room in downtown Los Altos. We recently caught up with Benny Madsen, the owner of Byington, at the light-filled and modern-style space, where the paint is practically just drying and a few more shelves and other fixtures are yet to be installed. The outlet serves multiple purposes, says Benny, and it fills a niche between a coffee shop and a full bar. 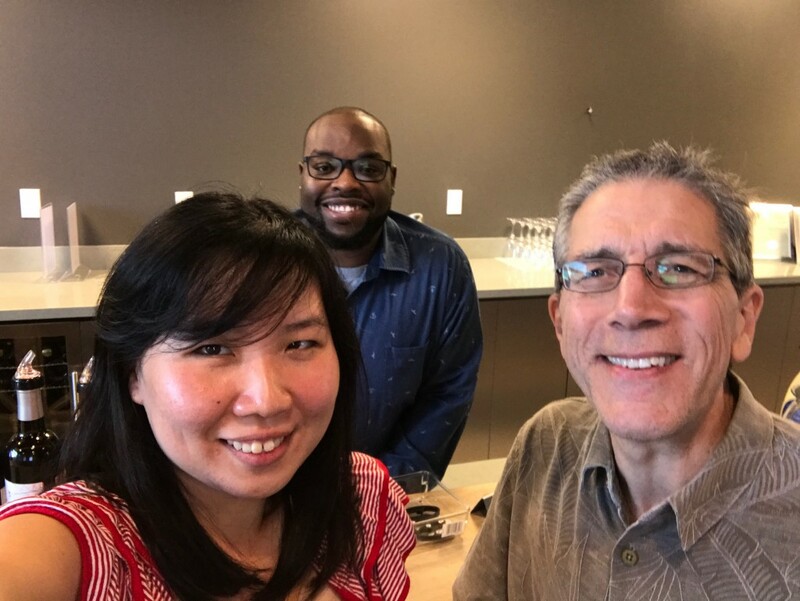 We take a moment for a selfie with Dre Council, wine tasting associate at the Los Altos Wine Tasting Room. He notes that the tasting room will also be available for corporate events, such as team-building exercises. Benny, who has had a very successful career in high tech, entered into the wine business less than five years ago. He must be a quick study. Not only has he acquired and significantly improved the operations at Byington and opened the Los Altos Tasting Room, he has also acquired another winery in the Pine Mountain-Cloverdale AVA (American Viticulture Area) in the heart of the Alexander Valley. In addition to the expansion of brand marketing, the second vineyard complements the grape varieties quite well. While the Santa Cruz location provides an abundance of Pinot Noir, the Alexander Valley locale supplies Cabernet Sauvignon, Cabernet Franc, Merlot, Chardonnay and Petit Berdot. Music, we are pleased to note, is a big part of Byington’s event calendar. “We do music (at the winery) every Sunday come rain or shine,” says Benny. He sees live music as a great way to not only provide a pleasant ambiance for the winery, but to help musical artists establish themselves. Benny knows a thing or two about music, as an amateur big band trombonist from his college days. But choosing his favorite big band composer is as futile as choosing a favorite wine from his vineyards. “I like them all,” he says with a laugh. This inspired us to make the hard choice of pairing Byington’s exclusive “Liage” white blend with a classic Duke Ellington tune: “I Got it Bad (And That Ain’t Good”). You can watch our latest installment of Wine Wednesday below. The new tasting room is open this weekend for the 38th Annual Los Altos Art & Wine Festival, which runs Saturday and Sunday, July 8 and 9, from 10 a.m. to 6 p.m. each day. We’ll be there. And we hope to see you as well. Wine Wednesday, S. 2, Ep 5: Byington Winery was originally published in WineWednesday on Medium, where people are continuing the conversation by highlighting and responding to this story.